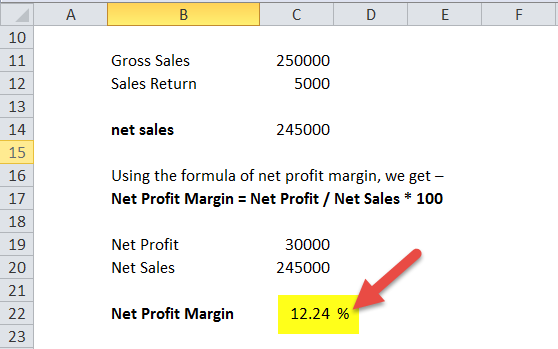 Net Profit Margin Formula is a significant profitability ratio. Every investor uses this ratio to find out how much percentage of Net Profit a company has earned at the end of the year. Let’s have a look at the net profit margin formula. For example, if we have a net profit of $10 and the net sales are $100; then the net margin would be = ($10 / $100 * 100) = 10%. To find out the “net profit”, every investor needs to look at the income statement of a company. At the end of the income statement, the investor will find the “net profit”. And to find the “net sales”, you also need to look at the income statement. To find out the “net sales”, we need to deduct any sales discount or sales return from the gross sales. By using the net margin formula, the investors are able to understand how much a firm has been profiting from its revenue. If the proportion of net profit is less compared to the net sales of the company, then the investors would enquire why it is so and may find other important details about the company. Similarly, if the net margin is too much, then also the investors need to see through other details to find out why the net margin is too good to be true. Plus if they know the net margin formula, it also tells them how much net profit a firm can extract out of their net revenue. However, if the investors think that the net profit would increase proportionately along with the net sales, the idea is false; because there can be expenses that are long term and will serve the company for long period of time and as a result, maybe the net profit would shrink. That’s why it is important to look at all of the figures before ever judging the performance of a company only through net profit margin formula. Find out the net margin of Uno Company. We know the gross sales, i.e. $250,000. The sales return is $5000. The net sales is = (Gross Sales – Sales Return) = ($250,000 – $5000) = $245,000. The net profit is also given, i.e. $30,000. Or, Net Margin = $30,000 / $245,000 * 100 = 12.25%. From the above calculation, we can find that the net margin of Uno Company is 12.25%. If we compare this net margin with the net margin of companies under similar industry, we will be able to make an interpretation about whether the net margin of Uno Company is good enough. Below is the snapshot of Colgate’s Income Statement from 2007 to 2015. Net margin is calculated for Colgate by dividing Net Profit by Sales. We note that Net Margin for Colgate has been in the range of 12.5% – 15%. However, it decreased substantially in 2015 to 8.6% primarily due to CP Venezuela Accounting changes. You can use the following Net Profit Margin Calculator. Let us now do the same example above in Excel. This is very simple. You need to provide the two inputs of Net Profit and Net Sales. You can easily calculate the Net Profit ratio in the template provided. 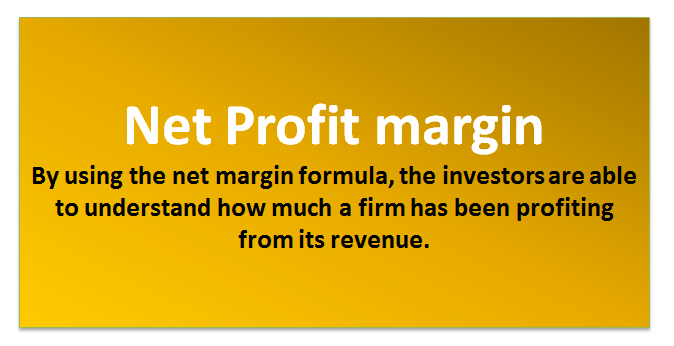 This has been a guide to Net Profit Margin formula, its uses along with practical examples. Here we also provide you with Net Profit Margin Calculator with downloadable excel template. The post Net Profit Margin Formula | Calculator (with Excel Template) appeared first on Learn Investment Banking: Financial Modeling Training Courses Online.